Some will call it boring, but awe-inspiring would be a better way to describe what Sebastian Vettel is achieving with Red Bull this Formula 1 season. 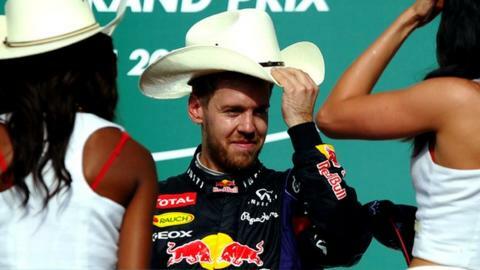 The German's typically copybook victory in Sunday's United States Grand Prix was his 12th in 18 races so far this season; more importantly for Vettel, it was his eighth in a row, the first time such a feat has been accomplished in a calendar year in 64 years of F1 history. It takes Vettel past legends Michael Schumacher and Alberto Ascari and sets him up to equal another all-time record in Brazil next weekend - Ascari's mark of nine consecutive F1 world championship victories, which the Italian set with Ferrari over the 1952 and '53 seasons. It has been clear for some time that breaking records is important to Vettel. He has tended through his spectacular career to play it down, but not on Sunday. The emotion in his voice was clear as he told his team over the radio on his slowing-down lap that they should enjoy the success because one day it would come to an end. "Any record for him means a great deal," Red Bull team principal Christian Horner said. "He doesn't expect to achieve them and so when he has - and he has quite a few now - he is genuinely quite humbled when he looks at the list of names what he's managed to achieve. "He is still a huge fan of the sport. He knows a lot about the history of the sport. He's probably one of a few drivers if you asked him who won the championship in '69, '73 and '78 he could rattle off those names, and I think that's why it means so much to him." Those names, for the record, are Jackie Stewart (twice) and Mario Andretti, who presented Vettel with the winning trophy at the Circuit of the Americas on Sunday. "Ascari, Mario, these guys are true legends of the sport," Vettel said. "There is a lot of things you need to get right to win a race and to win a championship is even more of an achievement so I really appreciate when I meet guys like him because they are the great heroes of the past and role models for all of us." Vettel said on Sunday that when he watched Michael Schumacher set his records, he never thought they would be beaten, let alone that he would have a chance of doing it himself. Yet already, at the age of 26, he has several to his name, and has time to break many more. The boy who sat in front of his television in Heppenheim dreaming that one day he might get the chance to race in F1 like his hero is now well on the way to becoming a legend himself. People will argue about the relative merits of Vettel and his two big rivals, Fernando Alonso and Lewis Hamilton, and say it's all about the car, that Alonso and Hamilton would beat Vettel if they had a car of comparable quality to a Red Bull. The truth is that, for now, it's impossible to know. The world may never get to find out how much truth there is in that view, but for now what's relevant is that Vettel is without doubt carving his own fully merited place in the F1 pantheon. He has won 38 races in his short, six-and-a-half year career, all but one of them with Red Bull since 2009, the year they began to dominate the sport. That season did not end in a championship title, but in all the others since Red Bull have swept all before them. Sometimes - as in 2010 and 2012 - it has been a close-run thing, but one thing has remained the same. For all those years, Vettel and Red Bull have set the standard for performance in F1. They have done it through an unquenchable quest to be as good as they can be, to never focus on what they have achieved, but only on what they have to do next, and how to continually improve. "I said it on the team radio," Vettel added. "The spirit is fantastic. Everybody's just happy to turn up, give it everything he has and I think - if there is one - that's the secret. "Yes, we have a phenomenal car; yes, the car has been mostly very, very reliable but I think it's the mindset we have going in, really trying to give it everything we have, not miss a single step." It might not always make great viewing, but Vettel and Red Bull are achieving a level of sporting excellence that is rarely seen in any arena. A burning competitiveness runs through the team, from Vettel, Horner and their brilliant design chief Adrian Newey on down. It drives a quest for perfection that remains unsated, and which was demonstrated in Austin on Sunday by - among other things - a new record 1.94-second pit stop. It will doubtless lead to more success. "We compete to the same regulations as all the others," Horner said. "We do the best job we can and then we measure ourselves against our opponents every couple of weeks. And it's not down to us to help the others to succeed. "Our focus is very much on ourselves and to improve and we will look at every grand prix to see how can we do better, whether that's operationally, technically, with reliability or from the drivers. We don't feel in any way bad about the fact we have done a lot of winning. We're very proud of it." "In sport, whether it's Roger Federer or Ferrari or Williams or McLaren you get phases of sportsmen and teams being dominant. At some point that does come to an end and then you have to regroup and go again. Sebastian is right, it is important to savour moments like today. It's our 46th win and it's easy to become complacent. You have to appreciate every single win." On Sunday afternoon, Vettel did his usual round of media interviews, posed for the obligatory celebratory team photo and went out to celebrate. By Monday morning, while savouring his success, he will already have his sights set on Brazil, on another win, another record, one that already seems inevitable. "When you realise that you've done it," he said. "It makes you very proud in that moment and I think it's very difficult for all of us to realise what it actually means. "People look back and they talk about certain drivers and one day people might look back and talk about our time and what we've done as a team." Of that, Vettel can be absolutely sure.